Here are another 10 Easy DIY Halloween Costumes. Are you still trying to find the perfect Halloween costume for your child? Are you looking for something fun and festive but still hoping to remain frugal in the process? If so, take a look at 10 easy DIY Halloween Costumes you can try this year. These costumes are so easy to create and you can do them on a dime. Most of the items you need to create the costumes below can be found in your own home or at your local dollar store, so you don’t need to worry about you going broke in the process. So are you ready to get started? Here are some ideas to get you going. Dress your child in some khakis and a white shirt. Add a vest of your own or cut a simple vest from a pillowcase. 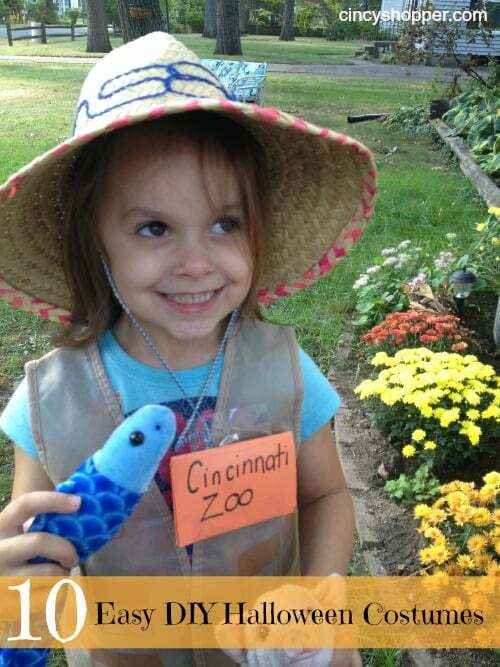 Have your child carry a stuffed animal or two, as well as a name tag made from paper with the name of your local zoo on it. Head to your local dollar store where eye patches and bandanas can be found. Wear a pair of ripped jeans and a white torn up shirt, add the eye patch and bandana over the head, and complete the look with some mascara on the face for facial hair. You can even pin a bird to the shoulder if you wish. A white lab coat or white adult’s dress shirt is all you need to make your little guy or gal look like a scientist. Frizz their hair for a mad scientist look. Allow them to hold some test tubes or mixing vials as the perfect accessories. Your child’s swimsuit and a snorkel set from the local dollar store is all you need to create an underwater explorer. Add some fake greenery to their back to look like sea weed or allow them to carry around a sea shell as the perfect accessory. A track suit and some fake gold medals from your local dollar store are all you need to make the perfect gold medalist. You can even let them hold a traditional bouquet of flowers to complete the look. Where a colorful sweat suit and pin a variety of colorful balloons to it. Add a balloon to a headband and wear that as a head piece. Add some colorful make up on the cheeks. The final result is what looks like a box of gumballs. Dress your child in a flannel shirt along with some ripped up jeans. Stuff the inside of the clothing with rags or newspaper for a bunched up look like a scarecrow would have. Add some freckles and patchwork shapes to the face with an eyeliner. Top the look off with a large, fun hat and plenty of straw tucked here and there. Find some basic doctor accessories at your local dollar store. A stethoscope will do. Wear a white lab coat or oversized white button up shirt. Top the look off with plenty of stuffed animals, a clipboard, and a name tag. Wear a colorful leotard or sweat suit covered with pinned on vines of greenery as found at your local dollar store. Glue flowers to a headband for a head piece. You can then add more flowers around the wrist and even on the toes of their shoes. Finish with some colorful face make up and a watering can. Find pom poms and a mega phone at the local dollar store. Wear a simple t-shirt with the child’s school name on it or make your own by gluing on a felt letter for the school. Wear a simple skirt, sweatpants, or leggings, and use eyeliner to write some words such as “Go team” on the child’s cheek to finish the look. As you can see, you don’t need to go broke in order to dress your child in some fun and creative costumes. You can create all of these looks in no time and with very little cash, making this a Halloween you are sure to enjoy and remember. Happy haunting! Still looking for additional DIY Easy Halloween Costumes? If so see another 10 Ideas I have for you here.